Science is fun, interesting, and relevant to our daily lives. The sweet spot of a baseball bat is the point at which it feels the best to hit the ball. You know what I'm talking about. There's no excess vibrations traveling from the bat to your hands, and the ball soars out of the park. The sweet spot has a scientific term: the center of percussion. Every time you hit a baseball bat with a ball, vibrations emanate along the bat in every direction from where it was hit. This is what causes your hands to vibrate when you hit the ball too low or too high on the bat. The center of percussion is the point where all the vibrations in the bat cancel each other out. This video from the Exploratorium goes into some of the physics behind hitting a baseball, and concludes with a musical application of the center of percussion. 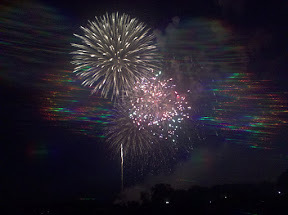 Last Sunday, I settled on the grass next to the Washington Monument to watch the Fourth of July fireworks, armed with a pair of diffraction glasses. Diffraction glasses, sometimes called rainbow glasses, have a special plastic lens which splits white light into the whole visible spectrum. Each lens has thousands of microscopic slits that cause the lens to act like a prism when light hits them. The colors in the rainbow you see are even in the order you learned in kindergarten with ROY G BIV--red, orange, yellow, green, blue, indigo, violet. This is the exact same process that happens when you see rainbows after a storm. In the case of rainbows in the wild, white light from the sun gets diffracted through the raindrops in the air. 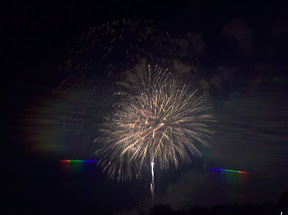 The rainbow that you see through diffraction glasses is called a spectrum. Because white light contains all the colors of the rainbow, you see all the colors when it gets diffracted. Everyday lights, even colored ones, shine in more than one single color, even if it seems like one color to you. If you look at a blue light through diffraction glasses you only see the colors that make up that particular blue--usually green, blue, and indigo. The other colors of the spectrum will be absent. The same thing will happen if you look at an orange light. 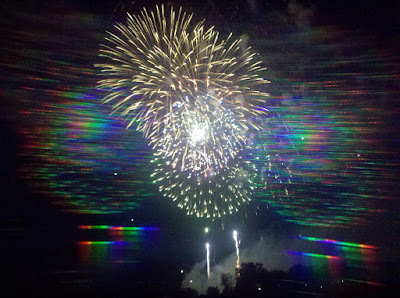 You will only see red, orange, and yellow in the diffraction glasses. Lasers are a special type of light that only emit in one color. If you look at the light from a laser using diffraction glasses, you will only see a single dot in the laser's spectrum, the same color as the laser. 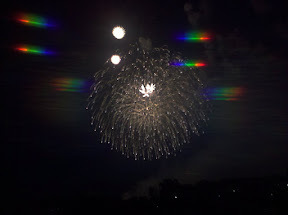 Here's a few more pictures of diffracted fireworks. When science and music combine, a beautiful thing happens. Take a look at these videos, and maybe these songs will teach you a little something about the way the universe works. The Large Hadron Collider (LHC) at the CERN lab over in Europe was finished recently, and physicists think that it will help answer questions about things we don't currently understand in particle physics. What the LHC does (and particle accelerators in general) is get particles, often protons, moving at extremely high speeds with lots of energy. Then they smash them into each other. The protons break apart into a shower of other particles. Physicists examine these other particles to try to determine what the universe is made of. Learn more specifics of the LHC via rap! And with this video you can watch They Might Be Giants teach us about the Sun. For more calculus-based fun, check out the Gauss's Law Song. Gauss's Law is a law describing how electric charge is related to electric field. In the Gauss's Law Song, physics professor Walter F. Smith explains how to do some of the math behind the law. Many more physics songs can be found at his website. Lastly, this cute little cartoon tells us the seven things necessary for something to be alive. Upon reading about how a German octopus is predicting the outcomes of World Cup matches, I started thinking about how cool octpuses are. The main reasons they are cool is their intelligence, their ability to change color, and their ability to squeeze into tiny spaces. Octopuses can be as smart as dogs, and are the most intelligent of the cephalopods. There have been numerous stories of captive octopuses leaving their tanks to grab a snack in a nearby tank, then going back home. I have heard stories of pet octopuses recognizing their owners, playing with toys, and solving puzzles. Here's an octopus opening a screw-top bottle. And here's an octopus forcing itself through a tiny hole, because it has no bones. And now one of the coolest videos of an octopus changing its appearance that you'll see all day. 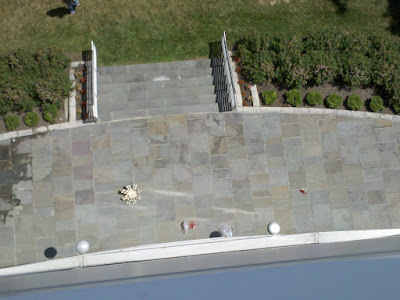 Two of my designs for the APS egg drop (described here) survived the fall from the fifth story. They both can be made out of materials that you can find anywhere. Mine are mostly office supplies. 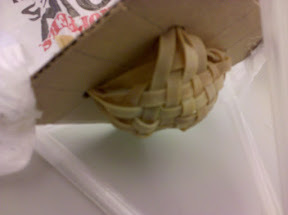 Its main ingredients are straws, rubber bands, cardboard, and a plastic bag. Including trial-and-error time, and waiting for glue to dry, it probably took me about an hour and a half to two hours to make. You might think that the parachute (aka, plastic grocery bag) would play a big roll in this design, and it did, but not in the way you might think. 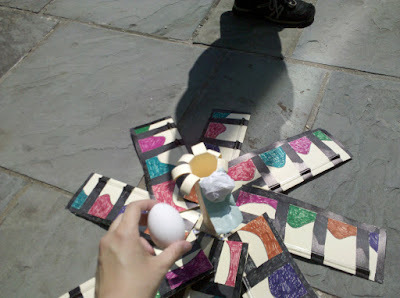 It did slow the contraption down somewhat, but the egg was still moving pretty fast when it hit the ground. Mostly, the parachute was to make sure that the device stayed upright, and hit the ground with the pyramid pointing down. 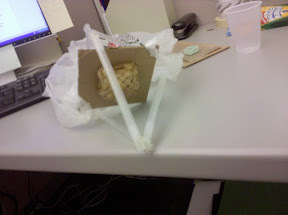 The most important parts of this design were the straws and the basket made of rubber bands. It has long been joked that it's not the fall that breaks the egg, it's the sudden stop. And, while often said with a sarcastic tone, that is what an egg drop boils down to. The less suddenly your egg stops, the greater chance it has of surviving. This design had three ways of lengthening the stopping time of the egg. 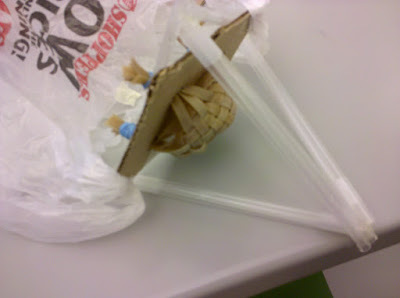 1) The parachute slowed down the whole device, so that the egg had a lower speed by the time it came to a stop, 2) the straws bent and cracked so that the whole contraption didn't stop suddenly upon hitting the ground, and 3) the rubber band basket kept the egg from feeling any sudden movements by stretching. My other device was more of a propeller. The idea behind this one was to get it spinning and moving more slowly, and have it float gently to the ground. This one is trickier to implement. It is basically a tube to hold the egg, with wings to make it spin and float. Mine has eight wings, but probably as few as five or six would work. More than eight would be time consuming to make. The wings should be as evenly spaced around a circle as possible, and at a slight angle to the horizontal, in order to spin, and not just act as a parachute. It is 90% made out of manila folders, but also includes straws, plastic knives, and liberal amounts of hot glue. 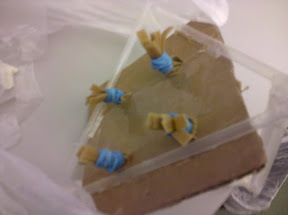 If someone is trying to recreate this design, I recommend using wooden skewers instead of knives and straws, but I made this out of materials I could find around the office. 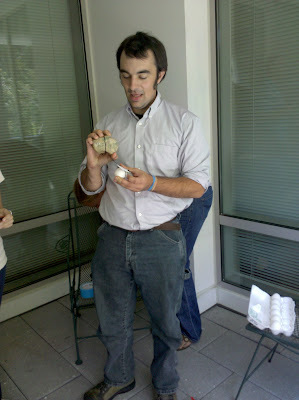 I also used some crumpled up pieces of paper shoved in the tube to act as some cushioning, and hold the egg in place. Here is a video of the propeller performing admirably for a few seconds. There are two reason for the epic failure of this contraption. What happened in this video is that the device flipped over, and dumped the egg out. I dropped it again later, this time with the egg taped securely inside the tube. The second problem was one of weight distribution. Most of the weight of this device is centered around the propeller area, and almost none in in the tube. Until there's an egg in there, in which case there is a good percentage of weight at the opposite end of the tube from the propeller. What I should have done is not put so much cushioning in the tube before the egg, so that the egg would have sat closer to where most of the weight of the device was, and it wouldn't have flipped. Working at the American Physical Society is a lot fun. 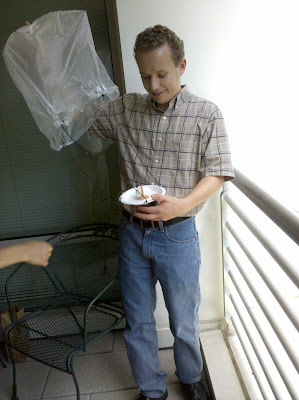 Friday afternoon, we had an egg drop. 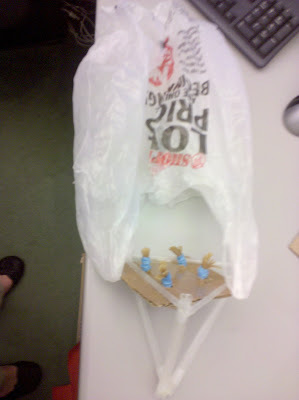 About ten people built devices, contraptions, and containers that would safely bring an egg to the ground when dropped from increasing heights. Many creative designs were entered into the competition, including helium rock, egg drop soup, The Jellyfish, and the eggcopter. Now here are some pictures to help tell the story. 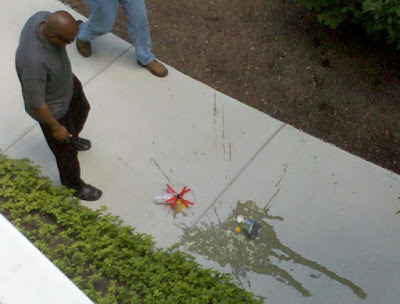 The eggcopter lays sadly on the ground, along with the mess left by egg drop soup. Eric's Jellyfish did fairly well. Though it might have done better had he started making it earlier than the day of the competition. Several contraptions on the ground, five stories below. That's a long way down. Next time I will go into the physics behind a few of the designs that did the best. Hi everyone, Linda here. This blog will be about science. Science news, cool science behind common things, scientific phenomena. There will likely be a lean toward topics in astronomy and physics, as that is my background, but I will post about all things that interest me. I am currently an intern at the American Physical Society for the summer. We have lots of fun around here. Later today an egg drop is scheduled, so I will be posting about that pretty soon. I am a recent graduate with a degree in Physics & Astronomy. I am very interested in science communication and informal science education.